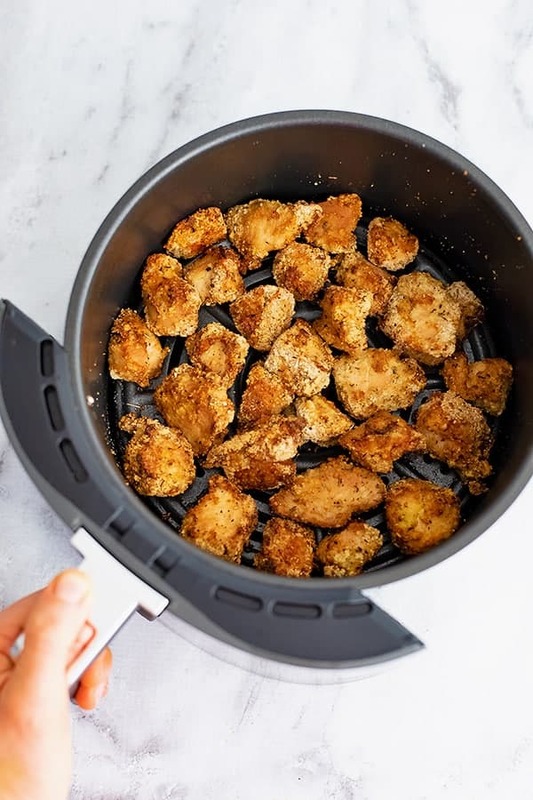 Air fryer chicken nuggets made with chicken breast and a simple grain free coating are going to become a family favorite! 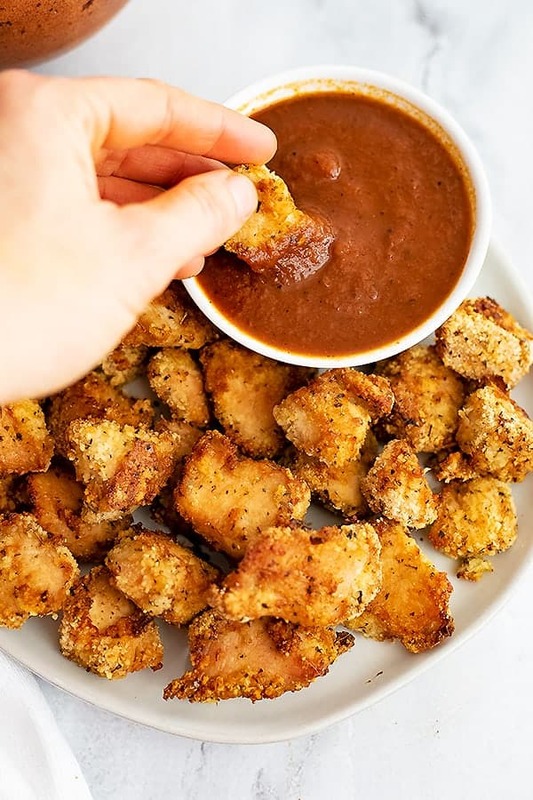 These healthy chicken nuggets are baked in the air fryer and get a crispy, golden, crunchy coating without added oil! Made with almond flour and arrowroot powder, these chicken nuggets are gluten free, egg free, grain free, paleo, low carb and Whole30 friendly! One of the favorite nights of the week is when I make homemade chicken nuggets for Dave! They smell amazing and Dave just adores them! I love how easy they are to make and now that I have the air fryer, I don’t have to heat up the whole kitchen to make them! The air fryer has easily become one of my favorite kitchen gadgets! I love making crispy roasted brussel sprouts, sweet potato fries and these healthy crispy chicken nuggets! What I love about using the air fryer to make these chicken nuggets is how crispy the crust gets! You can also make this recipe in the oven but I find that the chicken nuggets never get as crispy as in the air fryer. Since Dave is egg free, I have had to get creative with how to get the breading stick to chicken nuggets and chicken tenders. Well I have the perfect solution for that: Dijon Mustard! The dijon mustard works just as well as an egg wash and it also adds a layer of flavor to the chicken. If you don’t want to use the dijon mustard and can use eggs, you could also use a traditional egg wash (just whisk up an egg or two and dip the chicken nuggets in the egg before the crust mixture). Have 2 pans out for the chicken, one for the dijon mustard and one for the coating. Mix together the almond flour, arrowroot powder, salt and seasoning in one of the pans. Dredge the chicken in the seasoned mixture and be sure to fully coat the chicken. 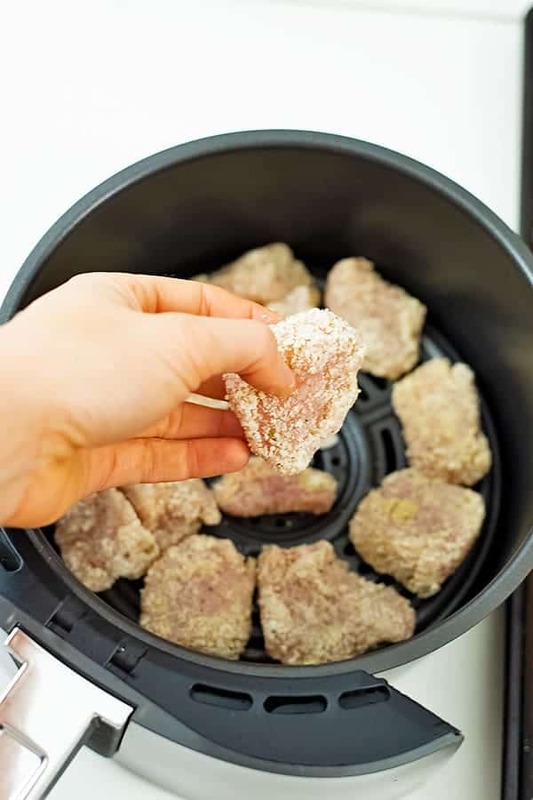 Place the chicken nuggets in the air fryer basket, making sure not to over crowd the basket. Depending on the size of your air fryer you may need to do this recipe in batches to cook all of the chicken. 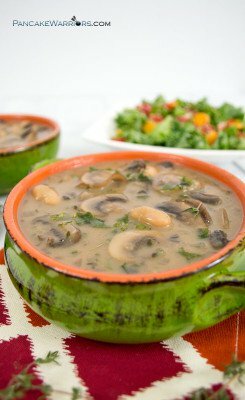 How to make these chicken nuggets nut free? Instead of almond flour you can use sunflower seed, pumpkin seed or hemp hearts. Put whatever seed you want to use in a high speed blender or food processor and blend until the seeds are broken down into a flour like texture. If you decide you want to double or triple the recipe, you can always store the extra chicken nuggets in the fridge for up to 3 days. If you need them to last longer than 3 days, you should put the air fryer chicken nuggets into the freezer and pull them out when you need them. Yes! After cooking, you can freeze the chicken nuggets after allowing them to cool completely. 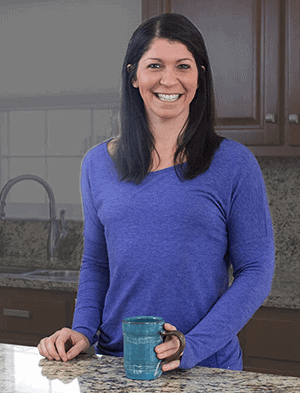 Freeze them in on a cookie sheet or in a gallon size freezer bag in a flat layer so they don’t freeze together. Once frozen you can transfer them to a freezer bag or freezer safe container. To reheat frozen air fryer chicken nuggets you can use the air fryer or the toaster oven. You could reheat these frozen chicken nuggets in the microwave but they may get soggy. What can you dip these chicken nuggets in? 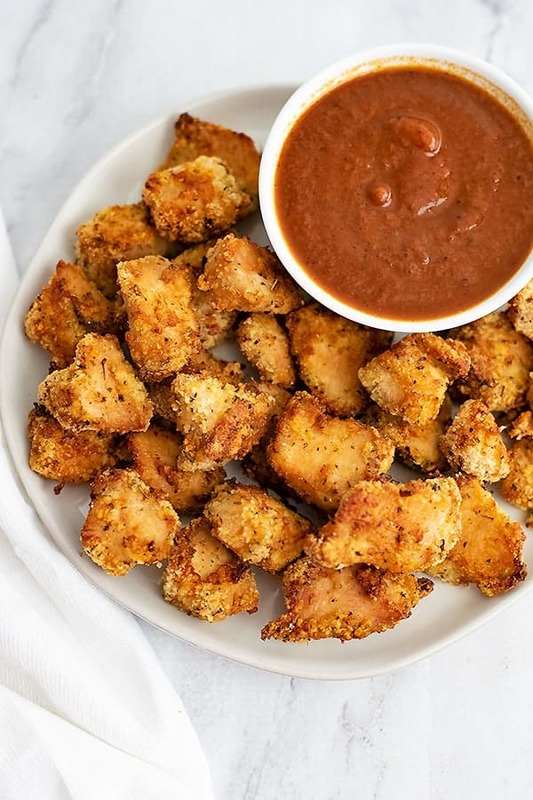 Air fryer chicken nuggets are an easy, healthy recipe that the whole family will love! 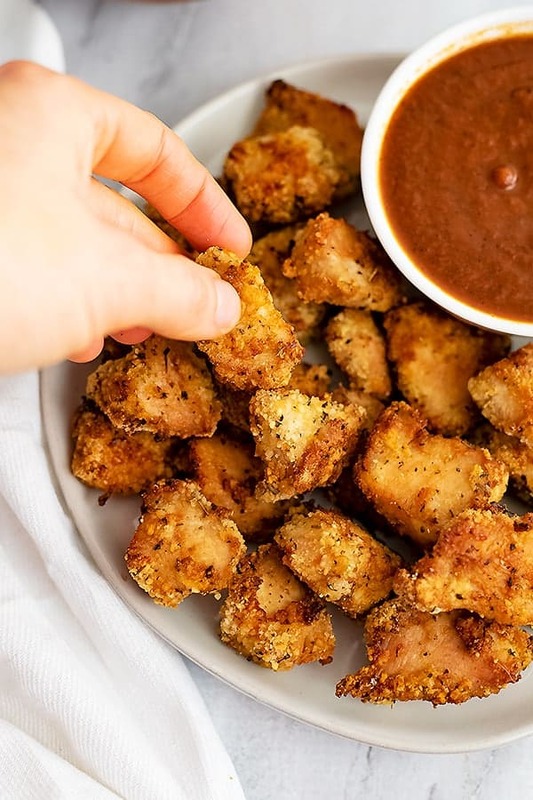 These low carb homemade chicken nuggets are made with almond flour and arrowroot making them gluten free, paleo and Whole30 friendly! 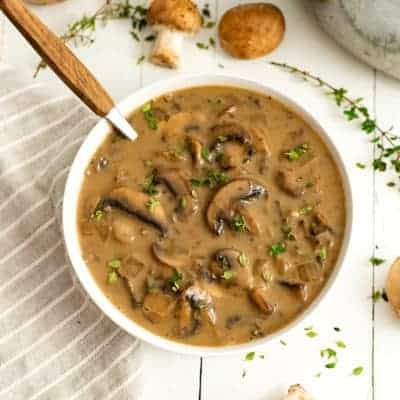 This simple recipe is egg free too and your kids are going to love them! Cut the chicken breast up into bite size pieces using a knife or kitchen shears. Place the cut up chicken in a separate large pan or plate. Add the dijon mustard to the chicken and coat the chicken, moving it around with your hands until fully coated with a thin layer of mustard. Transfer the chicken to the pan filled with the almond flour mixture a few pieces of chicken at a time. Coat the chicken nugget pieces in the almond flour mixture, being sure to press down and really make sure all sides are getting coated. Place the coated chicken into the air fryer basket, making sure it doesn't get over crowded. Cook at 390F for 15 minutes. After 9 minutes, flip the chicken carefully.